If we don’t do something, sooner or later Earth will be hit by an asteroid large enough to kill all or most of us. That includes the plants and animals, not just people. Maybe this won’t happen for millions of years. Maybe in 15 minutes. We don’t know. We have been warned. On 23 March 1989, asteroid 1989FC (with the potential impact energy of over 1000 megatons, roughly the equivalent a thousand of the most powerful nuclear bombs) missed Earth by about six hours [Freedman 1995]. We first saw this fellow after closest approach. If 1989FC had come in six hours later most of us would have been killed with zero warning. We are hit by thousands of smaller asteroids every year and we don’t see any of them before the collision. In October of 1990 a very small asteroid struck the Pacific Ocean with a blast about the size of the first atomic bomb (the one that leveled Hiroshima, Japan, killing roughly 200,000 people in seconds). If this asteroid had arrived ten hours later it would have struck in the middle of more than a million U.S. and Iraqi soldiers preparing for war. How would America have reacted to what looked like an Iraqi nuclear attack? Hiroshima-sized explosions due to asteroids actually occur in the Earth’s atmosphere about once a month [Lewis 1996b], but are seldom seen because most of the Earth is unpopulated. The data comes from Air Force satellites designed to look for nuclear explosions. In 1908 a small asteroid (perhaps 50 meters across) hit Tunguska, Siberia and flattened 60 million trees. That asteroid was so small it never even hit the ground, just exploded in mid-air. If it had arrived four hours and fifty-two minutes later it could have hit St. Petersburg [Lewis 1996b]. At the time St. Petersburg was the capital of Russia with a population of a few hundred thousand. The city would have ceased to exist. As it was, dust from the blast lit up the skies of Europe for days. Asteroid strikes this size probably happen about once every hundred years. However, this is just an average. Just because we got hit once doesn’t mean we’re safe for another hundred years. Indeed, there was another Tunguska-class strike in the Brazilian rain forest on 13 August 1930 [Lewis 1996b]. There are about 1,000 asteroids a kilometer or more in diameter that cross Earth’s orbit (the path Earth takes around the Sun). About a third of these will eventually hit Earth [Lewis 1996a]. An asteroid strike this large can be reasonably expected to kill a billion people or so, depending on where it hits. A strike in China or India would kill more, in Antarctica less. Even a strike in the ocean would create a tsunami so enormous most people living near the coast would be drowned. A strike of this size is expected about once every 300,000 years or so. It’s not just Earth. In 1178 our Moon was hit by an asteroid creating a 120,000 megaton explosion (about six times the force of Earth’s entire atomic arsenal). The collision dug a 20 km (12 mile) crater. This strike was recorded by a monk in Canterbury, England. We are extremely lucky it didn’t hit us. The Moon is a smaller target and has much less gravity to attract an impactor. If a 120,000 megaton blast had hit the Earth our history would have been dramatically different. We’re just lucky that one hit the Moon instead. The most recent large strike also missed Earth. In July 1994 the comet Shoemaker-Levy 9 plowed into Jupiter. The comet broke up into roughly 20 large pieces before contact, but when the pieces hit they left a string of enormous explosions clearly visible to our telescopes. The scale of the destruction was staggering. Each impact was the equivalent of about 10 million megatons of TNT. Sixty-five million years ago a huge asteroid several kilometers across slammed into the Yucatan Peninsula in Mexico. This is the event that caused the extinction of the dinosaurs (and many other species). The explosion was the equivalent of about 200 million megatons of dynamite, about the equivalent of all 20 pieces of Shoemaker-Levy. The blast turned the air around it into plasma — a material so hot electrons are ripped from the atomic nucleus and molecules cannot exist. This is the stuff the Sun is made of. Enormous quantities of red-hot materials were thrown into space, most of which rained down worldwide burning literally the entire planet to a crisp. Anything not underground or underwater was killed. This scenario has been repeated over and over, perhaps once every 100 million years or so. Each collision killed up to 95% of all species on Earth. As many as two-thirds of all species that ever existed may have been terminated by asteroids hitting the Earth. We know about the asteroid that killed the dinosaurs because we found the crater. But what happens when an asteroid hits the ocean? After all, oceans cover two-thirds of the Earth’s surface, and most asteroid strikes are in water. Unless the asteroid is very large there won’t be a crater. However, if you drop a rock into a lake it makes waves. The larger the rock the bigger the wave. Drop a 400 meter (four football fields) diameter asteroid into the Atlantic Ocean and you get a tsunami 60 meters (yards) high [Willoughby and McGuire 1995]. 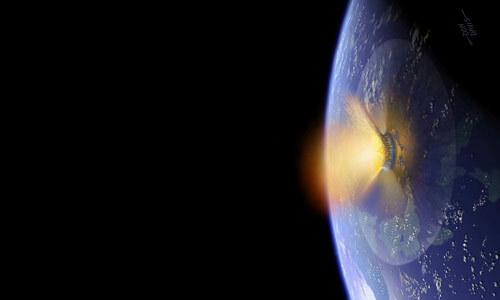 The only way to eliminate the threat of asteroids is to detect them and divert them. Right now we depend on a trickle of government funding for this. Detection of Earth-threatening rocks is very far from complete. At the present rate it will take years before we find just 90% of them. A vigorous space settlement civilization based on asteroidal materials would have enormous economic incentives to find and utilize every asteroid passing anywhere near Earth. They would be found, diverted, and mined for their materials. This would defuse the threat, make an awful lot of people extremely rich, and provide lovely homes to even more people. The B612 Foundation Sentinel Mission is the first privately funded interplanetary mission — an infrared space telescope to be placed in orbit around the Sun to discover, map, and track asteroids whose orbits approach Earth and threaten humanity. The Sentinel Space Telescope is scheduled to launch in 2017-18 aboard a Falcon 9 rocket. After 6.5 years of operation, Sentinel will discover about 500,000 NEAs. Sentinel will compile the definitive catalog of NEAs, and within a few years nearly all NEAs known to humanity will have been discovered by Sentinel (more than 98% after 6.5 years). [Freedman 1995] George Friedman, “The Increasing Recognition of Near-Earth-Objects (NEOs),” Space Manufacturing 10: Pathways to the High Frontier, Proceedings of the Twelfth SSI-Princeton Conference, 4-7 May 1995, edited by Barbara Faughnan, American Institute of Aeronautics and Astronautics (AIAA), pages 157-164. [Willoughby and McGuire 1995] Allan J. Willoughby and Melissa L. McGuire (1995), “Adroitly Avoiding Asteroids! Clobber, Coax or Consume?” Space Manufacturing 10: Pathways to the High Frontier, Proceedings of the Twelfth SSI-Princeton Conference, 4-7 May 1995, edited by Barbara Faughnan, American Institute of Aeronautics and Astronautics (AIAA), pages 103-113. B612 Foundation – Chaired by astronaut Rusty Schweickart, this foundation aims to develop the technology to divert asteroids from a collision course with Earth. A Ride with Earth – Animation showing the Earth in relation to objects within 20 million kilometers for the year beginning July 2007. Panoramic Survey Telescope & Rapid Response System (Pan-STARRS) – University of Hawaii program to detect dangerous asteroids. Mitigation of Hazardous Comets and Asteroids – Description of technical book edited by Michael J. S. Belton et. al. Cambridge University Press, 2004, 436 pages. Earth Impacts Effects Program – interactive web site from the Lunar and Planetary Laboratory of the University of Arizona, used for estimating the regional environmental consequences of an impact on Earth.